Los Angeles is burning. I just thought I’d start with that. Ok, Los Angeles itself is not burning, but there happens to be a number of huge fires burning right next door, filling our city with a thick layer of smoke. Air quality has actually reached hazardous. Let’s not forget, the temperatures have repeatedly hit triple digits. Needless to say, this is not the part of summer that people relish in. It also happens to be birthday season. You all know that everyone gets busy between Christmas and New Years so this happens to be a popular baby week. Guess what that means…birthday parties! My friend Jannatha’s birthday was this week and we had a sushi party (which is probably one of the best parties you could possibly have). I think it’s been about a year since I’ve made sushi myself, and though that was good, these veggie rolls were amazing. Since there are tons of places to find instructions on how to make sushi yourself online, I’m going to just give a few hints to making your sushi even more awesome. First and foremost, I insist you try something new. Being that I’m an LA native, I’ve been eating sushi since I was two years old. Yet, somehow I’ve never had a sweet potato roll. How is it that I’ve missed out on such an awesome kind of sushi? It’s so freaking good. Sauteed and sprinkled with a bit of brown sugar and hot sauce, it rivals my sushi favorite (avocado, is still the best though I think). 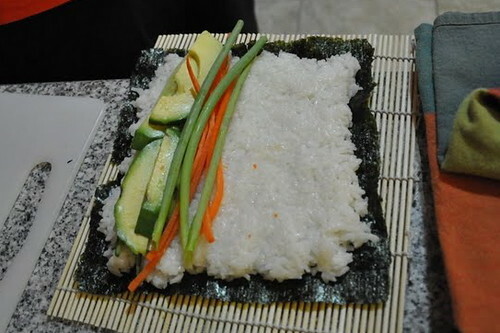 So on your next sushi excursion, throw in a vegetable you haven’t yet tried wrapped in rice and seaweed. My next suggestion perhaps goes a bit against conventional sushi wisdom. Put loads of veggies in your rolls. This can potentially make your rolls fall apart a bit easier, especially when dipping in soy sauce, but do it anyway. More veggies mean more great flavors. Try different combinations of crunchy and soft. Try different colors mixed together. Just make sure you press your rolls extra tight. Don’t forget the extras. One of the things that makes going out to a sushi dinner so special is not just the sushi itself, but all that comes along with it. Get some Japanese beer, perhaps some sake too. Whip up a little bit of miso soup. Many Japanese snacks are vegan too. I’m personally totally addicted to some seaweed crumble things that are sweet and salty and to die for. Definitely don’t forget the wasabi. If you’re afraid of wasabi, get some anyway. Mix a little in with your soy sauce and try it out. Even if you have too much, it stops being spicy after a second. Honestly, just try it. Last but certainly not least, stuff your face with sushi! I guess you should save some room for dessert though. We had red velvet cake, as every birthday needs a good cake (or cupcakes). Despite the summer heat and fires and ash falling on us, the evening was cool enough that we could eat outdoors. The best part about sushi is that besides the rice, you don’t have to cook anything if you don’t want to. You end up with a cool summer meal that is much more filling than a salad, and generally speaking, way tastier. Now get to it, go make some sushi! i’ve never had a sweet potato roll either…that sounds really good. one of my favorite (and possibly the weirdest) things to have in a sushi roll is green grapes. I’ve only seen in done at this one restaurant in Toronto called Island Sushi, but HOLY CRAP. They just slice the green grapes in half, and put one half in a roll with some avocado and other veggies…. and it’s to die for. woah grapes in sushi? that’s nuts. definitely going to have to try that. I love vegan sushi! Yours look so beautiful! I jzt love sushis! I wanna eat some this friday. Happy Birthday! I love a sweet sauce to eat with they sushis..we have this syrup in brazil made from the sugarcane..you mix it with soy sauce..amazing! p.s. Sweet potato roll !!! Sounds so yummy.